 Get your Breathe For Becky bracelet today!  Click the button and donate today! 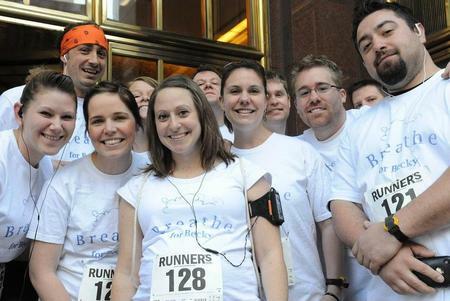 Donate or Join Team Breathe For Becky in the 2011 Fight For Air Climb! Donate to or join team Breathe For Becky! 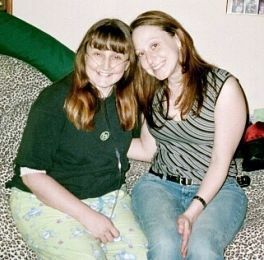 Almost 12 years ago I lost my sister to a rare lung disease. Ever since I have wanted to get involved, helping raise awareness and funds for the cause. Lung disease is the number three killer in America, responsible for one in six deaths. Lung disease and other breathing problems constitute one of the leading causes of death in babies younger than one year old. Today, more than 35 million Americans are living with chronic lung disease such as asthma, and chronic obstructive pulmonary disease (COPD) otherwise known as emphysema and chronic bronchitis. Every year more than 349,000 Americans die of lung disease. COPD is the fourth leading cause of death in the US and will continue to be a major health problem in the future. By, 2020, COPD will become the third leading cause of death in the United States. Lung Disease (and other breathing problems) is the number one killer of babies younger than one year old. For over 100 years, the American Lung Association has offered hope to people living with asthma, emphysema, lung cancer and other lung diseases. We also play an integral role shaping smoke- free legislation and even working to reduce air pollution. The Stair Climb is just one of the many events that we host to raise money for various community programs and research. Having a sister with a lung disease led me to working with the American Lung Association. Our 2016 team is signed up and ready to start raising funds and awareness. Click here to donate to my climb or to climb with me.